I invite you to try my spicy chutneys: Royal Coconut, Royal Mint, Royal Pomegranate, Royal Cranberry, Royal Plum, and Royal Tomato. 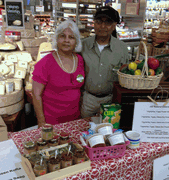 The chutneys have been created using treasured family recipes that I inherited over forty - seven years ago. These flavorful chutneys will more than satisfy your taste buds. Relinquish your preconceived ideas and travel on an international adventure beyond your wildest dreams. Also don't forget to try our frozen Samosa, Saag, Kofta, Rajma, and Roti Roll. Use our Ayurvedic Spices in any combination for any style of cooking, salads, or any edibles.